This may be my favorite of all my horns. 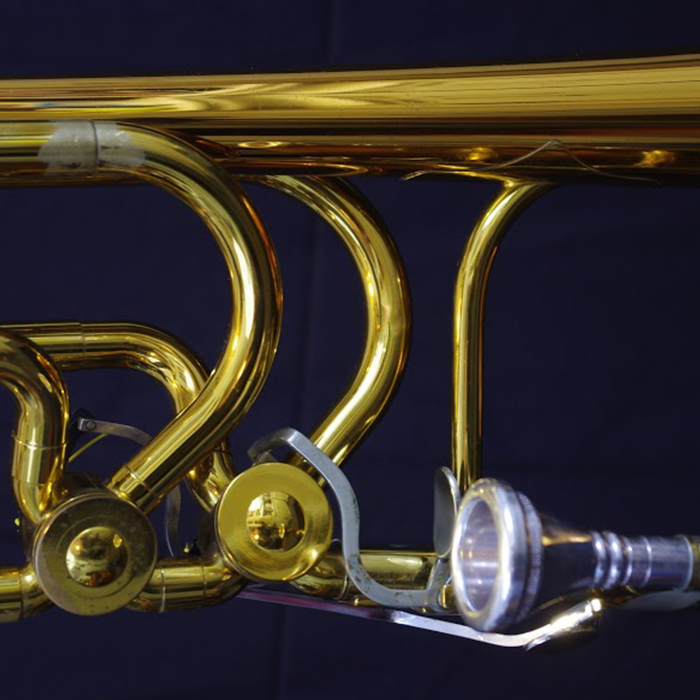 While the King 8B was not my first trombone, it was the first one that I bought for myself. 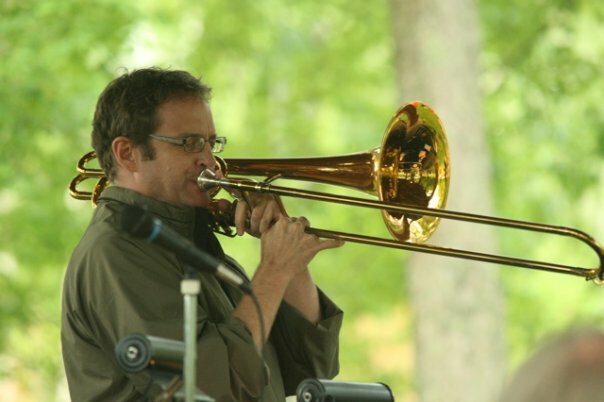 (That’s not actually true: the first trombone I bought for myself was my Olds ‘Super’. More about that in another post). I played in the Ceremonial Guard on Parliament Hill in Ottawa in the summer of ’82. At the end of the summer i had enough cash to buy a horn and this was the one i got. 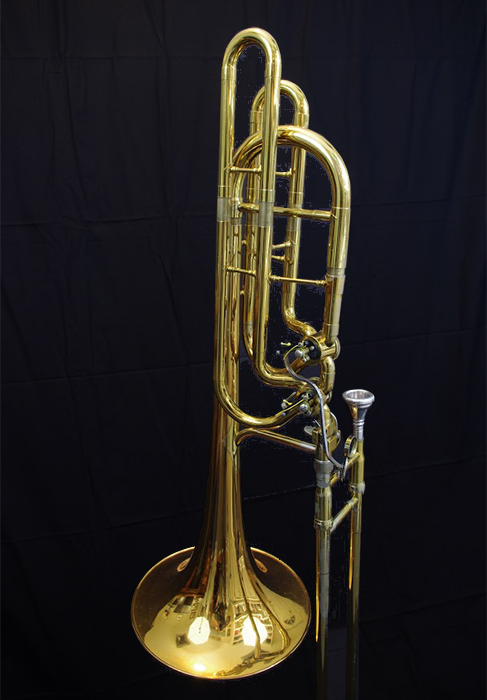 The 8B is a .562 single bore, dual inline valve Bass Trombone with a 10.5″ bell. 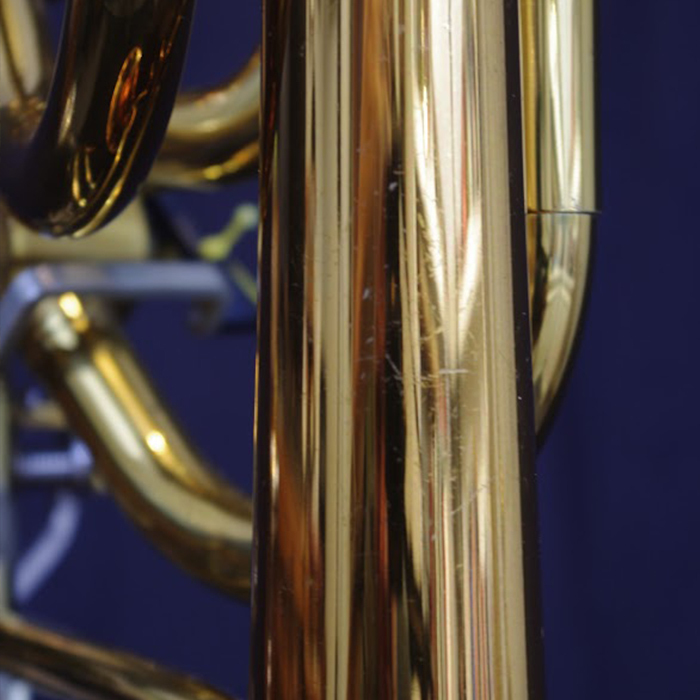 It’s a BIG trombone, but it has beautiful lines. 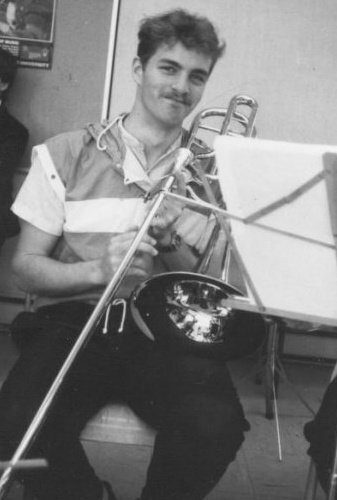 Back in the early ’80s most bass trombones came with a very tight wrap (the path the pipes take after the valves) and very tight angles in and out of the valves themselves. This led to instruments that were hard to play, and sounded ‘stuffy’. 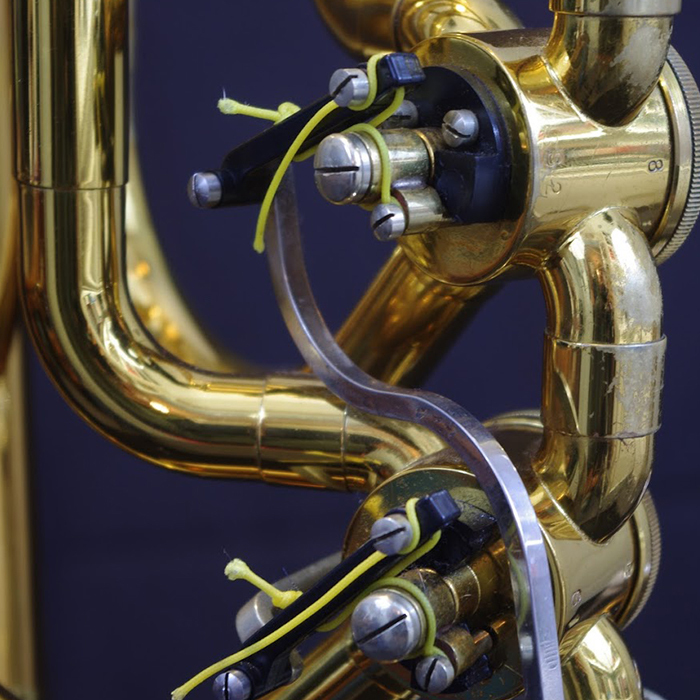 Bass trombonists were spending a lot of money having their instruments modified to give them an ‘open’ wrap. 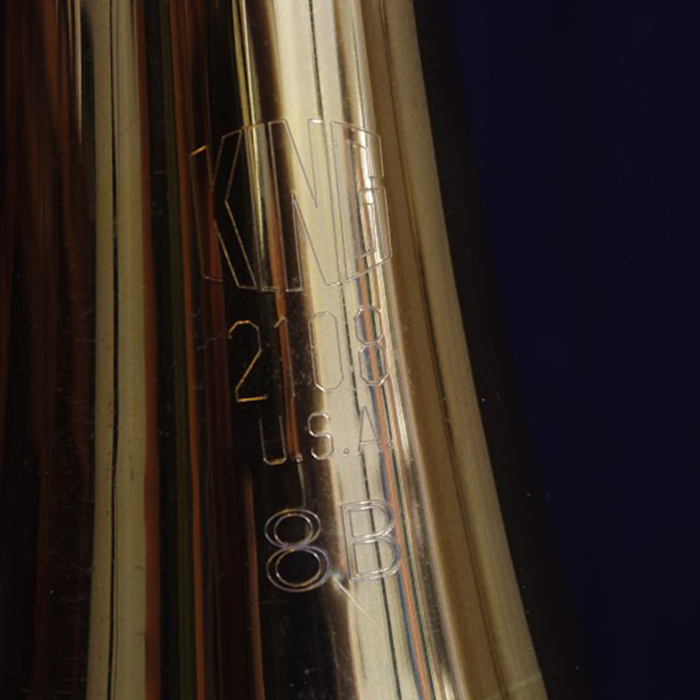 The King 8B was built not only with an open wrap, but the valves were set at an angle to avoid sharp bends as the pipes entered and exited the valves. Air moving through the horn encountered very little resistance because of the nice smooth lines and lack of sharp bends in the pipes. This made for a very easy blowing horn with a huge sound. You can see the beautiful lines in the vavle pipes. Graceful and flowing they were precursor of the ubiquitous open wraps of modern horns (which in my opinion are not nearly as attractive). When I was working as a musician I asked for them to ‘Mic the bass trombone and give him a solo’ so often that it got shortened to ‘Mic the bass trombone’ and that became it’s name. Mic is the only horn I have that I’ve named. 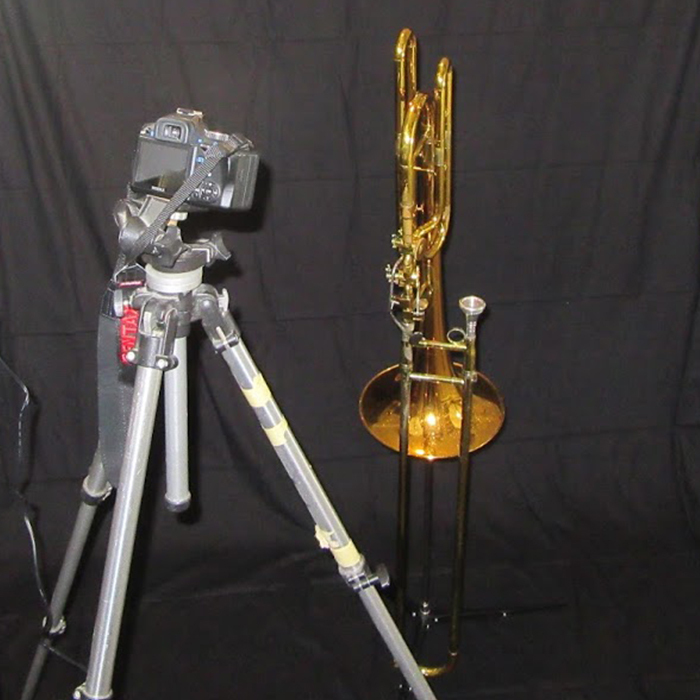 Mic the Bass Trombone in studio. Me and Mic when Mic was brand new. Look how happy we are! Me and Mic taking a solo. No mic for Mic though. I love the idea of doing something like this. Great photography too. Thanks Paul! I’m really enjoying the time I spend with my horns and doing the photography. It’s a lot of fun!